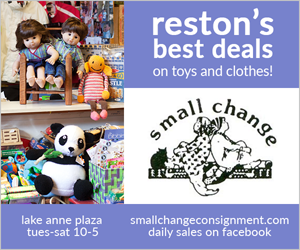 One of my favorite parts of writing for Modern Reston has been the opportunities to meet fascinating people in this community. Dancer Shu-Chen Cuff is one of those people. As I was looking through the schedule for this weekend’s Northern Virginia Fine Arts Festival at Reston Town Center, I learned that it will include dance performances as well as visual arts. One of the scheduled dance groups is Gin Dance Company, a modern dance company with a contemporary ballet style that is influenced by East Asian traditional dance. “The Dougherty sculpture is comprised of individual saplings intertwining with each other to give shape and form to an overall structure, bringing a level of meaning and purpose that any one sapling could never have done on its own. I was curious to learn more about “Six Degrees” and Gin Dance Company, so I met with Shu-Chen Cuff to chat over coffee. I enjoyed hearing about the upcoming dance performance, but I was particularly fascinated by Shu-Chen’s tales of dedication, courage, and optimism. 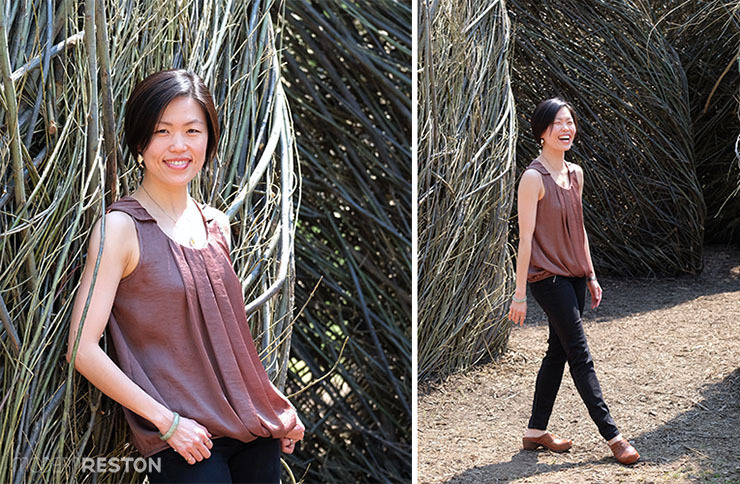 I asked if I could share the story of her path from Taiwan to Reston in search of a dream. Her story inspired me. I hope you will enjoy it, too. Shu-Chen carries an exuberant grace about her; her optimism and energy are contagious and uplifting. I can see why she is someone who managed to make her childhood dreams come true. She grinned as she told me that she’s always been a natural performer, wanting to be on stage and entertain at any opportunity. In elementary school, she was invited to take a formal dance class with a friend. Her father discouraged her from studying dance, and did not approve of the class. Young Shu-Gin decided to enroll in the class anyway. Without her parents’ support, she didn’t have the money or supplies for the class, so she danced in street clothes without tuition. She really wanted it, and was courageous enough to do it on her own. Finally her dad came to see her perform in class, and was moved by her talent and determination. He changed his mind and decided to encourage her love of dance. He paid the dance school tuition, and supported her the rest of the way. In high school in Taiwan, Shu-Gin was given an American dance magazine, and was exposed to Western style dance for the first time. She was spellbound by ballet, pointe, and modern dance. At this point, she had spent many years studying Taiwanese dance, which is rooted in more traditional Eastern styles of movement. She learned more about dance in America, and was intrigued. Shu-Gin’s uncle had emigrated to the U.S. many years earlier, and through that family connection, she was eligible for a U.S. Green Card in her late teens. When she finished high school, she announced to her family that she would be applying to American universities to study dance. She barely spoke the language, and left almost all of her family behind, but she accepted an offer to the University of Florida. This brave teenager boarded a flight for Miami, and set off to pursue her dream. Upon arriving in the U.S., a translation error by the immigration officers led to her name change. She was now Shu-Chen, college student. She had studied English in Taiwan, but her school had emphasized written English, not spoken English. So she started college with very little experience speaking the language. Her family was far away, the food was unfamiliar, and she had a lot of language to learn. I can’t imagine how much courage that must have required. She was so brave. Her efforts paid off. Upon graduation, she was offered a role with the Nevada Ballet Theater, which she joined for five years. Eventually she decided to return to the east coast, and she and her husband chose to settle in Reston. In 2011, Shu-Chen founded Gin Dance Company (GDC). Currently about ten dancers are part of this company, including Shu-Chen herself. They specialize in a fusion style of ballet mixed with modern dance and inspired by traditional Asian dance. 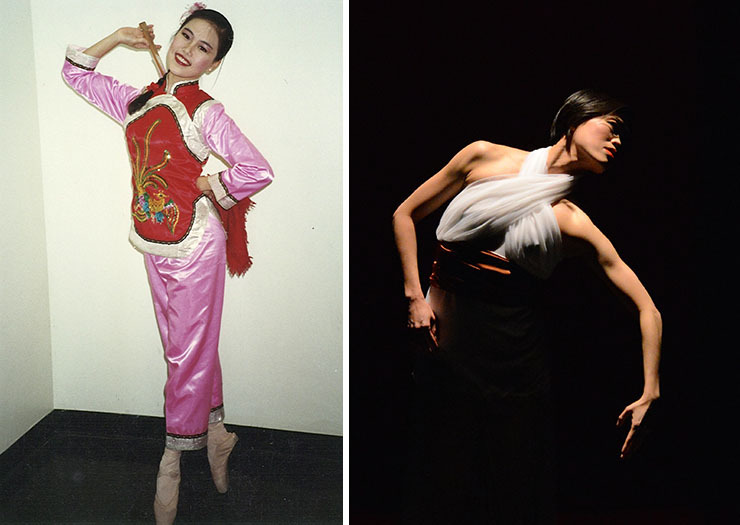 Shu-Chen Cuff demonstrates examples of East Asian dance posture (left) and Western ballet style (right). I asked Shu-Chen to explain to me the difference between ballet and Asian dance styles. She demonstrated to me the differences in posture that influence each style of dance. East Asian dance typically involves bending in three angles, while Western ballet involves keeping a straight and upright posture. Shu-Chen choreographs most of the company’s routines. Her focus is ballet, but as you can see in the above video of GDC performing “The Teller”, her work is highly influenced by her cultural background. Most of the dancers in Gin Dance Company do not share her Asian heritage, but they are able to adapt to several kinds of dance styles. I asked Shu-Chen whether her choreography inspiration comes from music, or whether she selects music based on her plans for a routine. She explained that inspiration can come either way. For example, the above video shows GDC performing to a medley of Mozart pieces. Her choreography was inspired by the humor she perceived in Mozart’s music. “Mozart is a funny guy,” she said to me, grinning. I had never noticed that about him. And sure enough, she created a light-hearted and fun tribute to his work in this performance. This weekend’s performances by Gin Dance Company will be inspired by Patrick Dougherty’s new public art piece, “A Bird in the Hand.” The performance will start with a small group of dancers having a picnic in front of the sculpture. As the performance continues, more dancers will join in the show, growing to about 19 performers total. Just as the individual sticks of the sculpture join together to create something more meaningful as a whole, Gin Dance Company will demonstrate the power of human connection. Meanwhile their artistic director is demonstrating the power of dedication, courage, and optimism. Come out this weekend and cheer for her and her dancer colleagues. What a talented and inspiring community we have in this town. 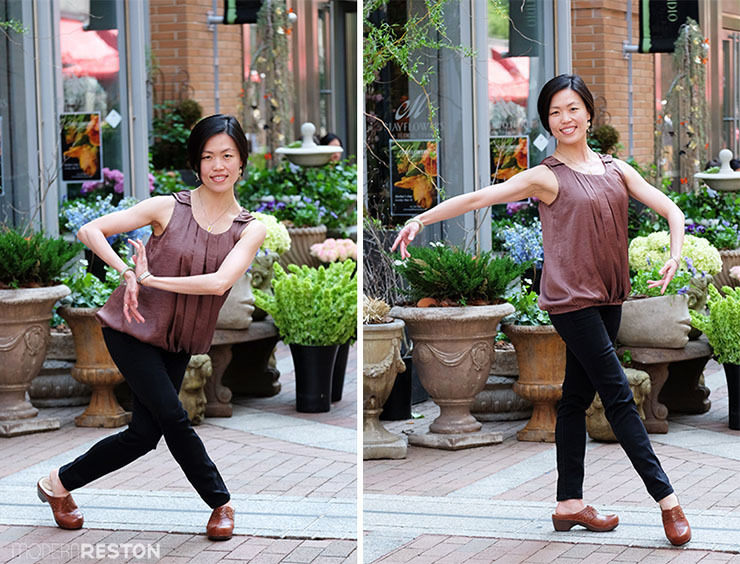 Gin Dance Company will perform at Reston Town Center’s Town Square Park during the Northern Virginia Fine Arts Festival on Saturday, May 16, 2015 at 1:00pm, and Sunday, May 17, 2015 at 11:00am. The performance is free, but there is a suggested donation of $5 for admission to the festival. Three other dance companies will be performing at the Fine Arts Festival. For more information, see the festival’s entertainment schedule.